Named for how it curls the leaves of infected plants, grapevine leafroll disease costs growers millions of dollars in lost vines and productivity. Until now, no one has been able to replicate one of the main culprits behind the disease, a virus called grapevine leafroll-associated virus 3 — leafroll 3, for short. For the first time, researchers in WSU's Department of Plant Pathology have found a way to clone leafroll 3, opening the door for experiments and treatments to protect valuable Washington vineyards. WSU research associate Sridhar Jarugula and professor Naidu Rayapati detailed the innovation in the latest issue of Virology. In a three-year project partly funded by the Washington State Wine Commission, they worked with colleagues at the University of Florida's Citrus Research and Education Center to successfully replicate the virus, and are now revealing its secrets. 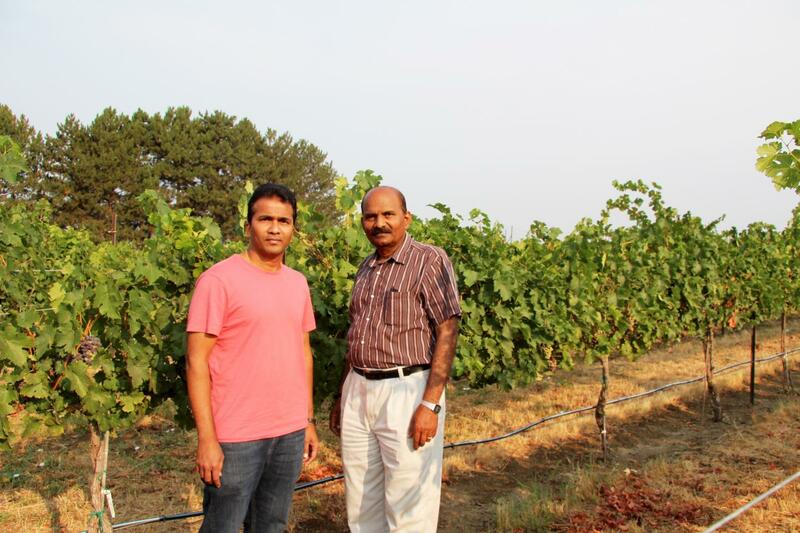 "Leafroll disease is the most complex and destructive viral disease of wine grapes, both here in Washington and throughout the world," said Jarugula, lead author of the Virology paper. Grapevine leaf roll disease is spread by mealybugs and scale insects, which transmit the virus as they feed on vines. Once in a vineyard, it's nearly impossible to control, except by roguing, or uprooting and destroying infected vines. "Once you have a sick plant, it stays sick for the rest of its life," explains Rayapati. Infected plants don't grow well, yielding small, uneven, poor-quality fruit. Eventually, they won't yield any grapes at all. "It's a major concern," added Rayapati. "And we don't have any way to control it." WSU researchers want to know why it's so destructively effective. "We need a way to manipulate this virus, tease out its genes and understand how it works," Rayapati said. "The challenge is that leafroll 3 is one of the most difficult viruses to work with," due in part to its large genome, one of the biggest among plant viruses. "We can't manually inoculate this virus from a sick plant to a healthy one," he added. "Because we don't have that luxury, we had to find another option." His team set out to replicate leafroll 3's entire genome in the lab. They partnered with a team of Florida researchers led by plant pathologists William O. Dawson and Siddarame Gowda, who had already successfully replicated the citrus tristeza virus, a cousin of leafroll virus that happens to have the largest genome ever discovered in a plant virus. Jarugula spent more than a year in Florida perfecting the technique for leafroll. The team successfully made a DNA copy of the virus' RNA genome, then infiltrated it into a tobacco plant with the help of an Agrobacterium, a soil bacterium that can transfer foreign DNA into plants. They found that the viral DNA copy replicated inside the plant cell was forming new virus particles. "It's a test tube copy of the virus," said Rayapati. "Now, we can use reverse genetics — working backwards by seeing how it expresses its genes physically — to find out how it works." "Our research will lead to new strategies that control grapevine leafroll disease in ways that really benefit our grape industry," said Jarugula. "This whole process itself is a breakthrough," added Rayapati. "This resource will help us build a better understanding of leafroll 3, and better defenses against it. We can make an enemy into an ally."